When Annie moves to Red Leaf, she's ready to call the little town home. Deputy Jesse Kent can't believe his mother has handed the keys to her bookshop over to a woman she met on the internet. Jesse has seen his mother taken advantage of before, and he decides to keep a close eye on this Annie Price. But when a close eye turns into a historical wedding reenactment with Jesse and Annie as the couple, make-believe nuptials quickly give way to real-life emotions. No one but Jake and Emma know the true reason they're getting married-so Emma's dying father can walk her down the aisle. While Jake and Emma plan an autumn wedding together, it becomes clear that their agreement has a few complications-the biggest being their true feelings for each other. Having celebrated the big 3-0 by ending a relationship, Sadie is tired of romantic relationships-by-text. The only man she knows willing to put down his iPhone and have face-to-face conversations with her is Erik. It's time to put a 21st-century twist on the Sadie Hawkins' tradition of a woman going after her man. But when he realizes he's fallen for her, can Erik convince Sadie his just-for-fun dates were the prelude to "'til death do us part"? 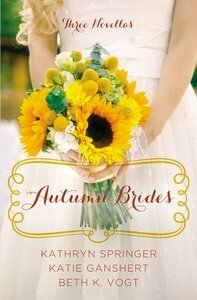 About "Autumn Brides (September, October, November) (A Year Of Weddings Novella Series)"
Beth K. Vogt is a writer whose work has appeared in Discipleship Journal, MOMSense, and Crosswalk.com. She lives in Colorado Springs, Colorado, with her family. Customer Reviews For "Autumn Brides (September, October, November) (A Year Of Weddings Novella Series)"
These three novellas were sweet, easy to read, and with a whole bunch of characters who made me laugh and fall in love with them. Definitely recommend this book to anyone who loves a good (albeit short) romance. Perfect for escaping the daily grind for an hour or two!